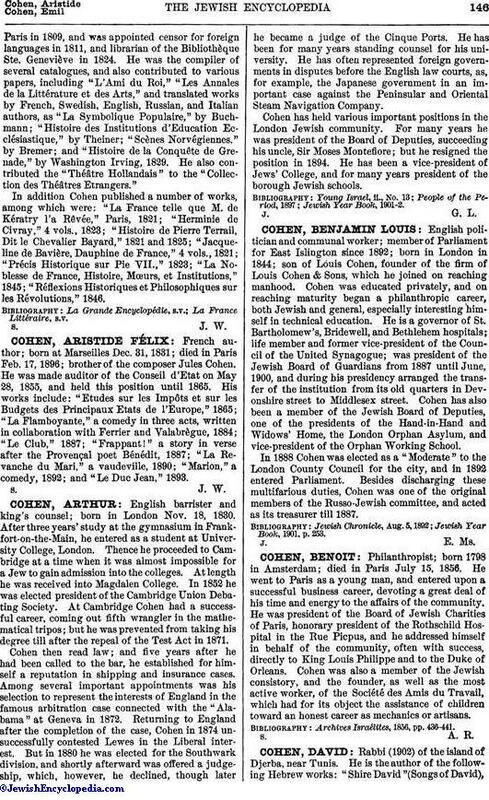 French author; born at Marseilles Dec. 31, 1831; died in Paris Feb. 17, 1896; brother of the composer Jules Cohen. He was made auditor of the Conseil d'Etat on May 28, 1855, and held this position until 1865. His works include: "Etudes sur les Impôts et sur les Budgets des Principaux Etats de l'Europe," 1865; "La Flamboyante," a comedy in three acts, written in collaboration with Ferrier and Valabrègue, 1884; "Le Club," 1887; "Frappant!" a story in verse after the Provençal poet Bénédit, 1887; "La Revanche du Mari," a vaudeville, 1890; "Marion," a comedy, 1892; and "Le Duc Jean," 1893.